Screenshot from "The hungry microbiome" by Christopher Hammang. Just like the workings of DNA within our cells, the intricacies of our gut microbiome are not easy to imagine. We know that gut bacteria is useful for our health, and we know that our intestines carry many more micro-organisms than the cells in our body. But what exactly do all those friendly bugs do? Let’s take one example. If you eat slightly green raw bananas, rolled oats or lentils, you’re ingesting stuff known as “resistant starch.” It’s a type of dietary fiber, and it’s beneficial for you, because some healthy gut bacteria like to feed on it. So how can a starch be useful to the human body? What do bacteria do with it? To explain this, help comes in the shape of animation. Christopher Hammang is a biomedical animator at CSIRO, where he researches molecular and cell biology to create accurate, detailed and aesthetically rich 3D animations. 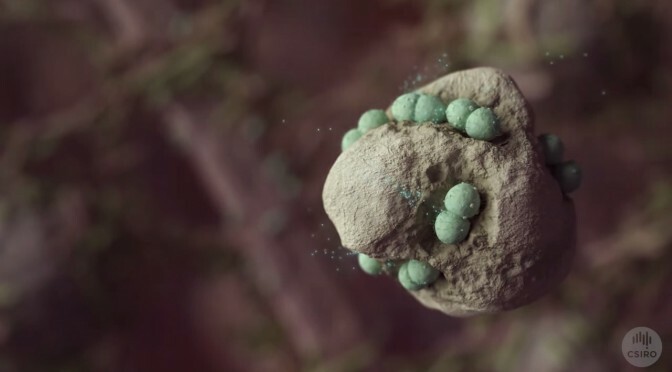 Watching an expertly animated video on gut bacteria will teach you much more than an abstract from a scientific journal. We know that many plant foods benefit our health. Scientists now believe one reason for this lies with the gut microbiome; the bacteria in your intestines. The video is one of the three animations recently released by the VIZBI project. The first comment posted by anyone is held in a moderation queue. We want to hear from you, which is why we prefer you to use your real name when commenting. We will also moderate comments that don't comply with our Constructive Commenting policy. Editor & Art curator of Wonder. Signe is a freelance science writer with work published in The Scientist, Australian Geographic, Australasian Science, and elsewhere.